While many people have taken steps to protect themselves online, others are still more vulnerable than they may think. Most computers come with some form of antivirus software, but this is only really scratching the surface of creating secure computer usage. Hackers with a little know-how can hack into your computer, phone, or other electronic devices whenever you connect to public wifi. Government and internet providers may be monitoring your activity whenever they see fit. A VPN service helps to anonymize your internet connection, increase security, and will even make your computer appear as if it is in a different location, protecting yourself and preventing intruders from hacking into your data. 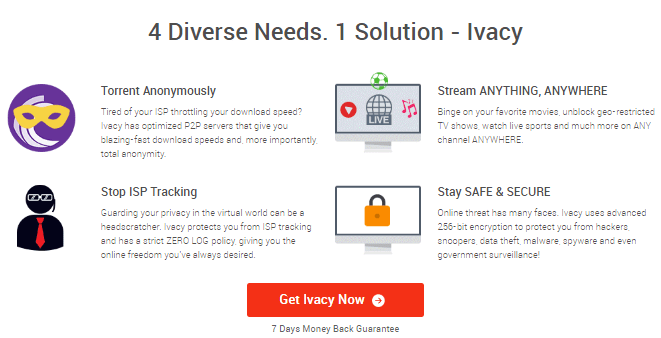 Ivacy is one VPN solution that can be used to help anonymize your internet connection, protect your data and become more secure in your internet usage. Ivacy was founded in 2007, and although it is pretty new in the VPN world, it has a lot of unique and valuable features that make it a great option for a VPN solution. Ivacy is one VPN service that aims to protect you and your computer by increasing your security and anonymizing your internet usage. Ivacy is available and compatible across many operating systems and devices including PC, Mac, Linux, Android, and iOS. The service even works with video game systems such as Xbox and PS4. You can also connect to the VPN using Blackberry devices, some routers, and smart TVs. Ivacy claims to be the fastest VPN available, and for most internet users this is an important consideration. Ivacy has some unique VPN features as well, such as Split Tunneling and Smart Purpose Selection. The company is based in Singapore but has many servers available throughout the world. Because the company is based in Singapore, the country’s Personal Data Protection Act helps to protect the privacy of users. Under this act, VPNs in the country are not required to log any user data. Ivacy boasts a large selection of servers and has over 200 to choose from, located in over 100 locations. These are suitable for all of your VPN needs and gives you plenty of options while increasing your anonymity and security. Unlike some VPNs, Ivacy offers unlimited server switching between these. Windows users can use a unique feature called Smart Purpose Selection, meaning you can let Ivacy choose the ideal server for you based on what your reason is for connecting to the VPN. While some VPNs cap your data usage for transferring data, Ivacy provides unlimited data usage meaning you won’t have to worry about any annoying data caps. Ivacy also allows for five different logins when using their VPN service. With Ivacy you’ll be able to connect to a VPN on up to five different devices, using the same account. For those looking to do some downloading, Ivacy has servers that have been optimized for P2P activity and torrent usage. Ivacy also aims to help users with online streaming and help to overcome any geo-targeting blocks of content. For example, many American Netflix users are unable to use the service while traveling abroad. Ivacy touts itself as an incredibly fast VPN. Since your internet connection is going through extra servers when using a VPN, your connection can sometimes slow to a halt and cause a lot of frustration. Speed is an important factor, so be sure to consider this when choosing a VPN. Their split tunneling feature allows you to choose which data goes through the VPN server and which data goes through your regular connection. According to Ivacy, they are the first VPN to offer this feature. Ivacy, of course, does a great job with all of the basic VPN features as well. The VPN provides identity theft and security protection when using public wi-fi, anonymous browsing, and strong encryption standards. Ivacy uses 256-bit encryption, meaning you’ll be safe and secure throughout usage. Other features include IPv6 leak protection and secure DNS. Multiple protocols are available for use including PPTP, L2TP / IPSec, SSTP, and OpenVPN (TCP & UDP) and you can use any of them as needed for your VPN connection. Another interesting feature is the Internet Kill Switch. The Internet Kill Switch will automatically stop internet activity in the case that you get disconnected from the VPN server. Unlike other VPNs, Ivacy doesn’t keep any logs, meaning that you’re in good hands and you don’t have to worry about any records being kept that may be wrestled from the hands of the VPN by government agencies later. Since the company is based in Singapore, there are no requirements for VPN services to log user activity and data. Ivacy also provides dedicated customer support should you run into trouble with any of the above features or services. Prices for Ivacy are relatively cheap compared to other VPN services, and three plans are available including a month to month plan, a 12-month plan, and a 24-month plan. If you choose the 12-month plan or the 24-month plan the monthly cost will be considerably cheaper. The month to month plan costs $11.95 per month. The 12-month plan costs $2.50 per month, or $29.95 total. The 24-month plan costs $1.66 per month, or $39.95 total. 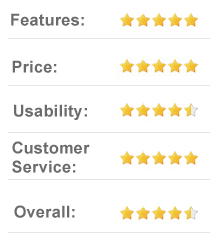 While our experience with Ivacy has been mostly positive, some negative reviews can be found online. There have been various complaints about speed and other performance issues, although many customers are completely happy with their service. Some customers have had issues with certain protocols not working for all of the available servers. One major complaint that Ivacy has received is the nature of their free trial. Ivacy claims to have a seven-day money back guarantee, but it is not always honored. There seem to be some very restrictive terms that need to be met to qualify for the refund. Many customers who have wanted a refund were unable to get one because they have used too much data already. When messaging and asking for a refund, many customers have been given the runaround. Some users have had to go through many back-and-forth messages with customer support before being offered a refund. Other customers have been unable to receive a refund at all. 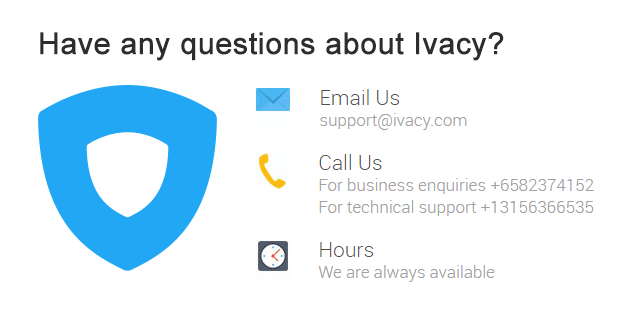 Ivacy has dedicated customer support to help with any needs users may have. You can reach Ivacy representatives by live chat, email, and phone. 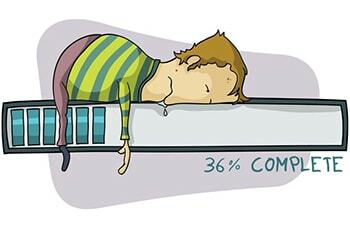 You can also easily open a support ticket to resolve your issue. It is impressive that you can get in touch with customer support in so many different ways since many other VPN providers offer only one or two methods. Ivacy also has an active social media presence and has Twitter, Facebook, and Google Plus accounts. Although there are plenty of other options available to get in touch with customer service, they have also been known to answer questions on these social media platforms as well. In addition to communicating with a customer support representative, Ivacy also has excellent resources in place to educate yourself on how to use the features of the VPN. 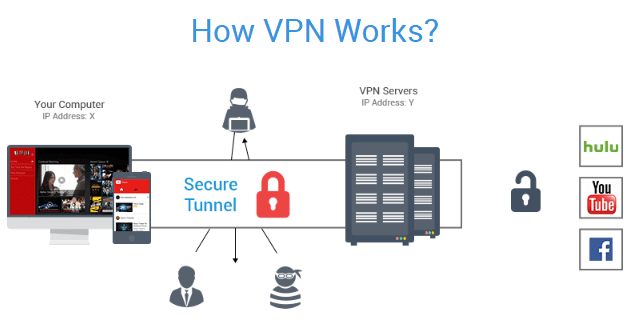 They have a useful FAQ available as well as an extensive knowledge base, both of which are helpful for finding the answers to more general questions about the VPN service. They also have an active blog which answers many common VPN questions and concerns. Ivacy is a great VPN to use for all of your anonymity, privacy, and security needs. They are a fast VPN and they have some great features that are unique to them alone. The company also delivers all of the features you expect from a typical VPN service as well. Ivacy’s prices are very reasonable and a good bit cheaper than many other services, especially if you decide to stick with the VPN for a 12 month or 24 month period. Most customers are satisfied with the support they have received, but some have had trouble. Regardless, Ivacy makes it incredibly easy to get in touch and many have been satisfied with their responsiveness and resolution of issues. Despite the possible drawbacks, Ivacy is a great VPN service all in all. As far as VPNs go, the company more than delivers on just about anything one could hope for with this type of company. With their unique and numerous features, Ivacy is a worth a look for any internet users looking to invest in a quality VPN service and help make their internet connections more secure and anonymous.